Accupunture, Detox, Liver Flush, Kidney Flush by Global Expert Andres Lokuta, Doctor in Chinese Medicines. 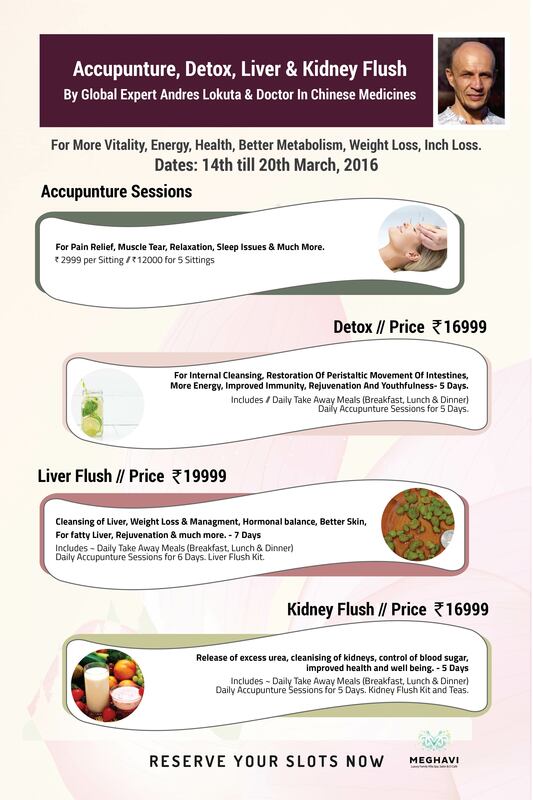 Accupunture Session: Rs.2999 per Sitting. Dates: 14th till 20th March 2016. Prices: Rs. 12000 for 5 Sittings. Daily Accupunture Sessions for 5 Days. P.S.- Please note you need to Visit Meghavi Daily for 30 Minutes between 8:30am till 8:00pm for Recieiving your Accupunture Session. Daily Accupunture Sessions for 6 Days. Kidney Flush – 5 Days. Kidney Flush Kit and Teas.